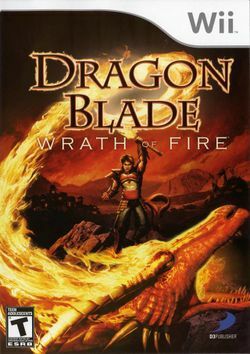 Dragon Blade: Wrath of Fire (ドラゴンブレイド, Dragon Blade: Wrath of Fire?) is a game for the Wii from Land Ho! and D3Publisher, which was released on September 25, 2007. The game is a hack and slash game, mixed with beat 'em up and RPG aspects, similar to God of War and Devil May Cry. In the game, the Wii Remote is used as the weapon held by the main character. At first, it is a sword that can only slash and defend, but as you advance in the game, you gain more weapon transformations. There are twenty levels in the game, and five worlds (four levels per world). To fight, players can lock on to enemies and either shoot fire with the dragon head or do various close combat techniques depending on which weapon is being used. Dragon Blade follows a young adventurer named Dal who seeks six legendary pieces of the "Dragon Blade," each infused with the soul of different guardian dragons. In an attempt to build the ultimate weapon and vanquish evil, the young protagonist embarks on a quest to find and seal away each of the six dragons, taking their souls and abilities in the process. He is accompanied by a mysterious red dragon named Valthorian who's soul is the source of the Dragon Blade's powers. The plot was written by Richard A. Knaak, writer of Dragonlance novels. This page was last edited on 14 January 2012, at 00:52.